called: Dimming Neon: Signs of the Recent Past. 1624 South 1100 East in Salt Lake City, Utah. Open Monday-Sunday 7:30a.m. – 2:30p.m. show at which time the buyer will be contacted for pick-up. Matt’s dad Dale is planning a huge yard sale as a fund raiser for Matt & Brooke. Thank you to everyone who came out to make the 3rd annual SLCA competition and party a success. Thanks to the generous support of our sponsors and attendees, door receipts and donations added up to a sizable sum! The funds raised by the event will be used to maintain fixed anchors and to preserve access to climbing areas. A HUGE thank you to Rachel Strate, indefatigable fund raiser extraordinaire. 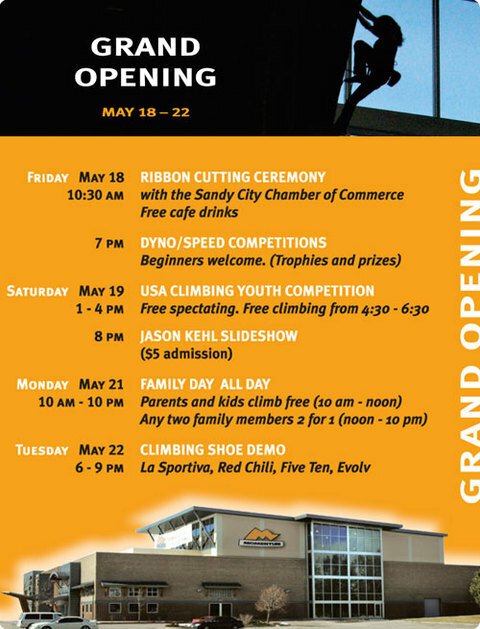 Special thanks to sponsors Backcountry.com, Black Diamond, Liberty Mountain, Petzl and The Front Climbing Club. Thanks to our sponsors Arcteryx, Barbacoa, Climbing Magazine, Evolv, Five Ten, Ikon, IME, Intermountain T-Shirt, Metolius, Mike Call, Momentum Climbing Gym, Momentum Video Magazine, Mountain Hardwear, Prana, Revolution, Rockreation, Rock and Ice, Scarpa, Sterling Rope, The Quarry Climbing Gym, Uinta Brewing and Urban Climber. Big thanks to our great volunteer coordinator Agnes Chiao, all of our volunteers, and the SLCA staff. Thanks also to Brendan Nicholson for his great poster and t-shirt designs and Mike White of the ASCA for educating attendees about anchor replacement. Again, thank you to everybody that came out to the competition and party, through your support and that of our sponsors, the SLCA can continue our work to keep climbing accessible and our anchors safe. Check it out and join the SLCA. Even if you are already on the mailing list, sign up – I will make sure duplicate email addresses on the list are purged. Please help support the Salt Lake Climbers Alliance at the 3rd annual climbing competition and party. Climb in the comp, if only to try and burn off your friends on the pink taped problem. Then stay for the party and satisfy your post-comp hunger and thirst. Rumor has it MC will be showing some exclusive footage as well. If you appreciate fixed anchors that stay in the rock, and having local areas open to climbing, support the SLCA by attending a fun event. Cost for party only: $15 donation, $5 off for pre-registration. If Front members wish to attend the party only, the Front will cover your donation. You are currently browsing the Utahclimbers.com blog archives for May, 2007.